Durban – The Hollywoodbets Dolphins began their 2017/18 Momentum One Day Cup campaign with a strong performance as they beat the WSB Cape Cobras by 26 runs at Sahara Stadium Kingsmead on Thursday. Winning the toss and batting first, the Dolphins equalled the highest 50 over score at Kingsmead when they registered a commanding 315/7. 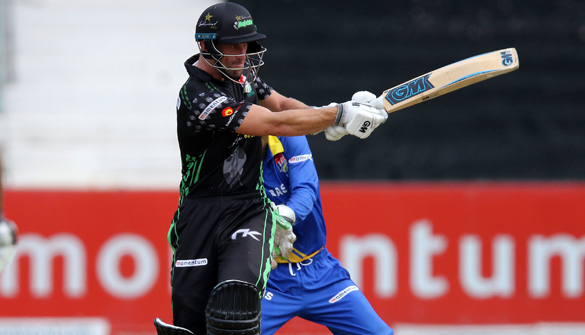 At the top of the order, Vaughn van Jaarsveld showed the form that he has presented throughout the season as he eased his way to a stylish 89 from 82 balls before an unnecessary mix-up lead to him being run out at the non-strikers end. The left-hander hit 11 fours and two sixes in his innings that helped his side continue with their strong start after him and opening partner Morné van Wyk (24) put on 50 for the first wicket. Senuran Muthusamy was then bowled by Cobras skipper JP Duminy for 12 leaving the Dolphins 94/2 in the 19th over. After 25 overs the Dolphins were 120/2 with Van Jaarsveld and player of the match Dane Vilas calmly putting the foundation together for a strong finish. The rapid first half of the innings set up the likes of Vilas and captain Khaya Zondo who pressed down the accelerator as they added a quick fire 96 from 71 deliveries for the fourth wicket. Vilas proved why he has been such a valuable acquisition for the Dolphins as plundered the Cobras bowlers to all parts of the ground. He then chipped a Ferisco Adams delivery to JP Duminy, in the pursuit of quick runs, and was caught for a quality 91 from just 68 deliveries. Captain Zondo fell soon after Vilas for 31 which threatened to stifle the Dolphins charge to 300, however Sibs Makhanya, with a run-a-ball 22, Rob Frylinck with 19 and Prenelan Subrayen 13 not out off four balls got the Dolphins to an imposing total. Richard Levi transpired to put the Dolphins under pressure early as he stroked his team to 53/1 from the first 10 overs. Of the 53 runs scored Levi had 33 of them and was in dangerous form. He and Aviwe Mgijima continued until Mgijima was bowled by Calvin Savage for 18 with the score on 74 from 14 overs. Cobras captain JP Duminy and Levi worked the ball around with ease and scored freely from just under 10 overs until Levi was brilliantly caught by captain Khaya Zondo at mid-wicket off Senuran Muthusamy for 68. Qaasim Adams came and went when he was bowled by Zondo for five and when Ferisco Adams was trapped in front by Muthusamy for 17 the Cobras were 157/5 from just over 30 overs. The men from the Cape still required 159 runs from 118 deliveries. Some good bowling through the latter stages of the middle of the innings from the Dolphins forced the Cobras into taking on the Dolphins attack, as they required nearly eleven runs an over for the final 10 overs. Following Rory Kleinveldt’s withdrawal from the match on the cusp of the toss when he dislocated a finger, all-rounder Jason Smith replaced him and showed his prowess with the bat towards the end of the innings. Batting at number seven, Smith smashed an impressive 56 from 50 deliveries in an attempt to claw his side back into the game. He eventually fell in the 45th over when he was brilliantly caught by Morné van Wyk off the bowling of Mthokozisi Shezi and the Cobras were staring down defeat at 265/7 with four overs left. Shezi was the top wicket taker for the Dolphins with 4/67 in just over nine overs as the Dolphins bowled out the visitors for 289 in 49.2 overs. Prenelan Subrayen put in a strong performance with the ball and despite not picking up a wicket finished with figures of 0/27 in eight overs. Muthusamy too returned with good figures of 2/14 in four overs. The Hollywoodbets Dolphins travel to Senwes Park in Potechfstroom for their final game of 2017 when they take on the bizhub Highveld Lions in the Momentum One Day Cup on Saturday, 23 December.